This month we’re challenging ourselves to try harder, work harder, and do things we never thought we could do. "I can't do a pullup." We believe YES YOU CAN!!! Let's do it together and we'll show you how!! Can't do a pullup YET... Modify by using stretch bands, TRX Row, chinups, etc. Can do them in your sleep... Ok challenge yourself to close grip chinups, commando pullups, one arm, muscle ups, etc. Pullups are known as the "squats of the upper body" because of all the muscles they work at the same time. 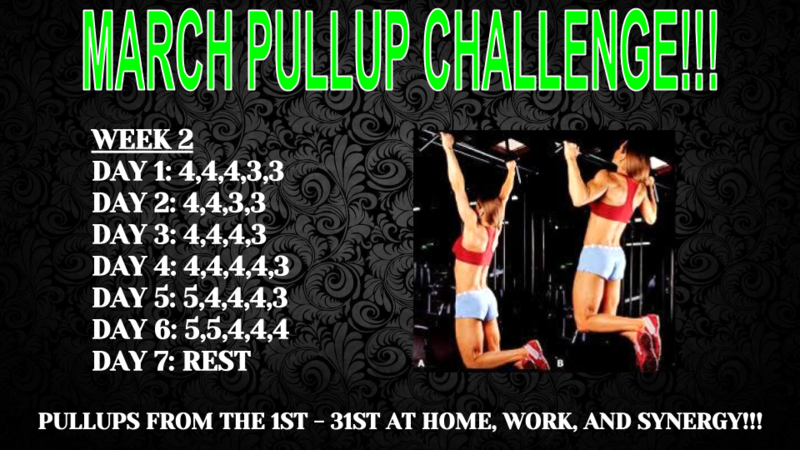 Have fun with our Pullup Challenge this month and stay committed to the end so you can see how your body transforms through the end. 3, 2, 1, Let’s Row!!!! Inching closer each day, during the month of January row either a half-marathon (LEVEL 1) or full-marathon (LEVEL 2) total distance on our Concept 2 "erg" rowers. Row a little bit each day and make it all add up over the whole month!! Do it as your warmup, cool down, or come in just to row for your workout. Have fun, make it a competition with others if you want, have fun, row for cardio, have fun, row with a buddy, have fun, burn TONS of calories, and most of all have fun! Chip away at your meters however you want. Each day row some more, keep a tally on our Challenge whiteboard, and on Jan 31st have your half or full marathon row completed. Take the challenge and let's step it up this month!! 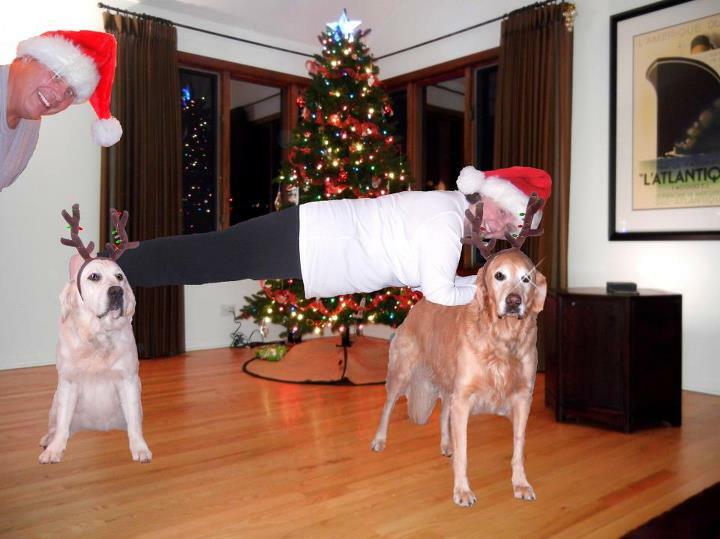 It’s time to make plans for the holidays, but don’t forget to make time for your workouts too!! Please see below for our holiday class schedule. This time of year is filled with fun, family, friends, and of course food. It can get pretty crazy too and among all this busyness we tend to completely abandon what we've worked for over so many months. This is also the time of year where people seem to allow their routines of fitness and healthy eating fade into the background. Why do we do this? I think that answer is not as hard as we might think. It is, of course, because of the fun, family, friends, and food, BUT what do we need to do to not get swept up in this cycle that makes our fitness and healthy eating routines fade in the first place? I mean our physical goals still exist right? And we still are committed to them right? Well yes of course we are, but what is it that changes during this time of year that completely dissolves once January hits and we suddenly have a new rekindling of all passion and energy to go again after our goals like nothing can stop us? The answer doesn't matter as much as does thesolution. First what I recommend is definitely not beating yourself up when diet debauchery happens, and we know it will, or you miss a workout to keep watching a 4-hour Netflix binge because this is bound to happen and we all know it. Instead, on the most craziest of days, when you cannot make it into the gym, carve out 20-30 minutes and get in some kind of activity that gets your heart rate up. Keep it simple. It doesn't have to be some elaborate workout. In fact, if you do a brief warmup, and then go hard for 10 minutes, that can be all the time you need to benefit yourself enough for that day. Another recommendation is getting your workout in early in the day, if you can, before everything else you need to do. The holidays it might make our schedule nuts, but we can still find a block of time to fit in 10, 20, or maybe even 30 whole minutes a day to do something for ourselves that we will be proud we did and come January we won't have to start again from scratch. Every year we have a 30 Day Challenge to Plank for time and in public. 2 Plank Categories To Win! Challenge who you are and see who you will become! 1 min = 1 raffle entry Every minute you plank take one raffle ticket. Example: Plank 5 minutes you take 5 tickets. If you’re new to Planking… TRY THIS: Day 1: 1 minute plank Day 2: 1 minute 10 second plank Day 3: 1 minute 20 second plank And so on adding at least 10 seconds every day for our entire challenge. Planking can be on forearms or hands (with straight arms). Post a pic of you Planking in public, at a unique location, on your Facebook or Instagram or directly on Synergy's Facebook Page. Tag “Synergy Kettlebell” and use the Hashtag #SynergyPlankChallenge so we get notified and see your pic. That’s all you need to do to be entered into our challenge raffle contest!! Few things are as beautiful as the rays of the morning sun. The first light of morning is energizing and motivating—unless you’ve been awake half the night. In this case, the morning light just means that you didn’t get enough sleep. Again. As soon as those first rays hit your eyes, your stress begins to mount. You’re exhausted. How are you going to make it all day long on so little sleep? You feel emotional just anticipating the struggle to concentrate and stay alert—especially during the afternoon hours when the drowsiness really kicks in. Does this describe you? If so, you are not alone. The National Sleep Foundation reports that 60% of Americans have sleep problems. That means more than half of us struggle to sleep. The reasons for sleep difficulties are many—from stress to caffeine to individual differences in body rhythms. But whatever the cause, the bottom line is that if you suffer from insomnia or other even minor sleep issues, you need help. And one of the safest ways to get that help may be to take melatonin. You have probably heard of melatonin. It is a hormone produced by your brain in your pineal gland. Some of your melatonin is also produced in your gut. Mainly, melatonin helps to control your sleep and wake cycles. Normally, melatonin levels will begin to increase in the mid to late evening, stay high during the night, and then begin to decrease early in the morning. This helps you to sleep during the night and be ready to wake up in the morning. When there are higher amounts of melatonin in your body, you feel sleepy. When the levels are lower, you feel more alert and awake. Your regular sleep and wake cycle is your own internal clock, and this clock is directly tied to how much or how little melatonin your body makes. There are other things that affect the melatonin in our bodies. For example, as we age, our bodies produce less melatonin. Daylight plays a key role, too. When the days are shorter during the winter, the time of day that our bodies produce melatonin changes. Rather than producing melatonin during the mid to late evening hours, we may get a surge of it earlier in the day as the daylight begins fading earlier. When the amount of melatonin or the production schedule of melatonin changes in your body, you may find yourself struggling with sleep patterns. Without enough melatonin, you will have trouble sleeping. But even if you make enough melatonin, your internal clock may be off if the melatonin is being released at the wrong time of day. Nobody wants to get sleepy at 5:00 PM from a melatonin release! Not only is this inconvenient, but also, when the natural decrease happens several hours later (to help you wake up), you’ll be alert and ready for the day by 3:00 AM! Fortunately, if your melatonin levels are low or simply off schedule, you can help yourself by taking a melatonin supplement. These are available without a prescription at drugstores and at health food stores. Just be sure to buy a reputable brand to ensure you get a quality product. Doses range from 0.1 to 20 mg, depending on the reason you are taking it. Your doctor can help you choose the right dose, as well as help you determine the best time in the evening to take it. Timing is important, since the melatonin, once ingested, will run its course in your body—taking you from drowsiness to wakefulness on schedule. It’s a handy way to reset your internal clock and get the sleep you need.